Question:This year is the worse year we have seen for this fly in 17 years.When it is hot and dry you cannot go out to work the gardens unless you have plenty of spray and a hooded net jacket. Is there anything we can do to kill, catch or dispose of these flies? Thank you for any advise. Answer: I knew I saved this picture for some reason. This is one person’s solution to deer flies. Not very fashionable, but deer flies tend to land on the back of their victim’s heads. 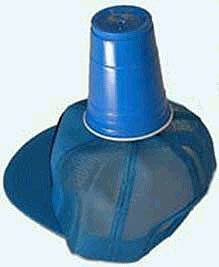 Hence a Solo cup attached to the hat, with fly paper or other sticky material on the cup to trap the flies.